Aagta Traders was incorporated in the early 80's. 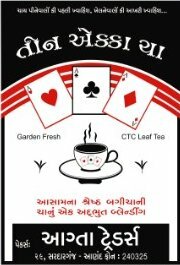 Aagta Traders has been promoted by Shri Ashokkumar Thakkar, who gained vast experience in retailing and marketing of teas. The family has been engaged in the business of retailing and marketing of tea, jaggery, and other consumer goods for three generations. It was natural that he go into business in order to surround himself with it. Aagta Traders is the enterprise specializing in retailing and marketing tea and other agro products. The company was established in 1983, our promoter has had over thirty years of experience in marketing agro products. Aagta Traders has always paid special attention to the customer's need. Our focus is to; “Sell customers what they need and not what is available with company”. Thus, company has strong trading relationships with customers. The goal of Aagta Traders is to blend and offer the finest collection of teas. It is a difference that we have not found elsewhere and we hope you will notice. The quality of the leaves, the taste and the experience makes our company unique. Never has a simple beverage had so much ability to bring people together. We think Aagta Traders offers the best of it to you.